We had the truck in to work on the E-60 pump on it. 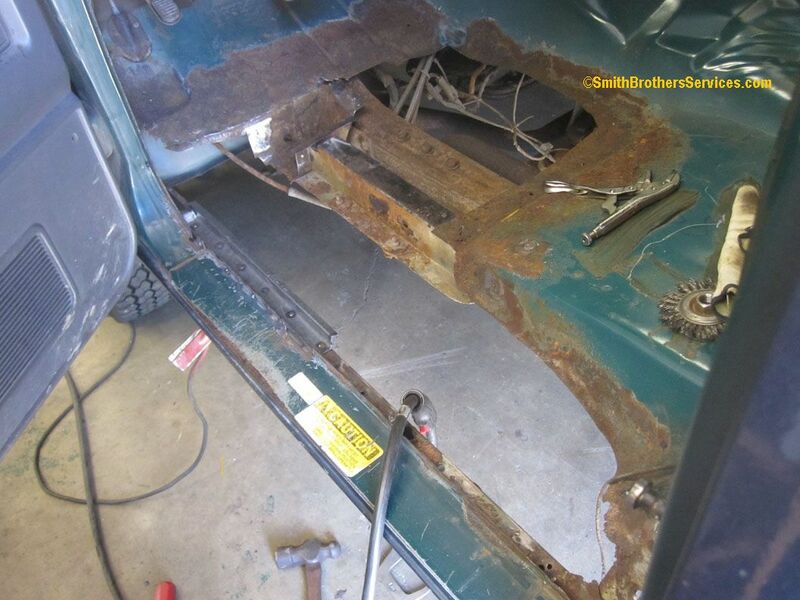 While it was here, we were going to take a look at repairing the holes in the floor on the driver's side. I was hesitant as to do the job or not, as the rust is always worse than you first think it is. I know how it goes. 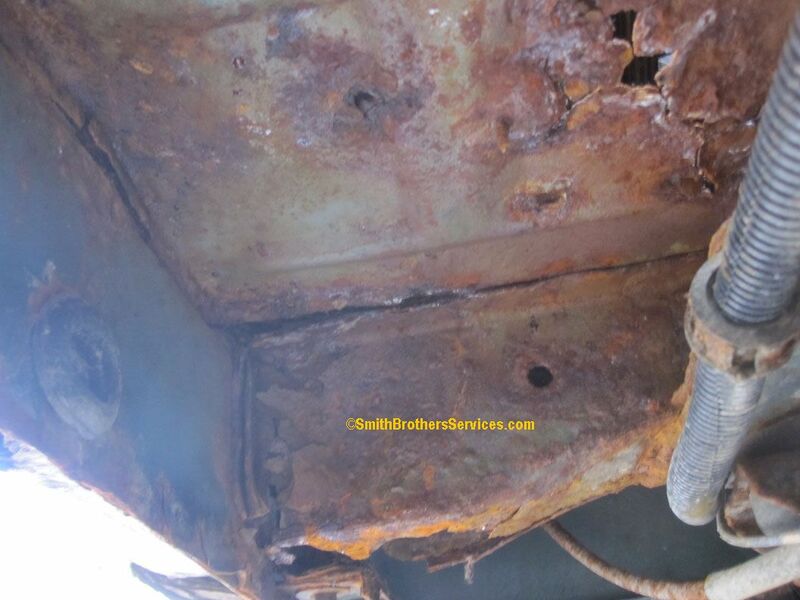 Then the customer is surprised at how bad the rust is. Which in the end is also a surprise at how costly the repairs were. Once the job is started, there is no turning back. Doing the job right, is going to take a lot of time, it always does. There are always surprises along the way, that add more time and cost to the job. 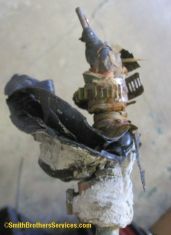 This is why I decline these types of repairs regularly. All that said, I decided to take on the repair. The customer doesn't need the truck. 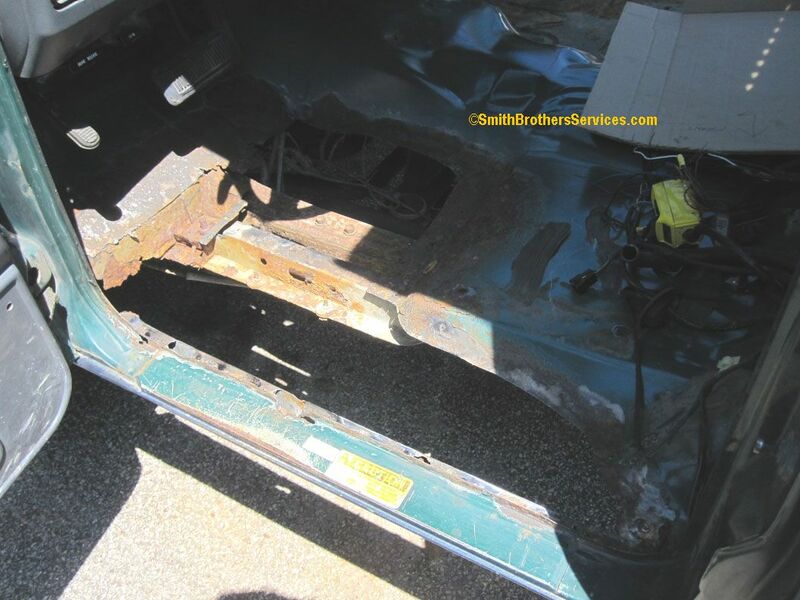 It can stay here for a reasonable amount of time to make the repairs. A very common occurrence. 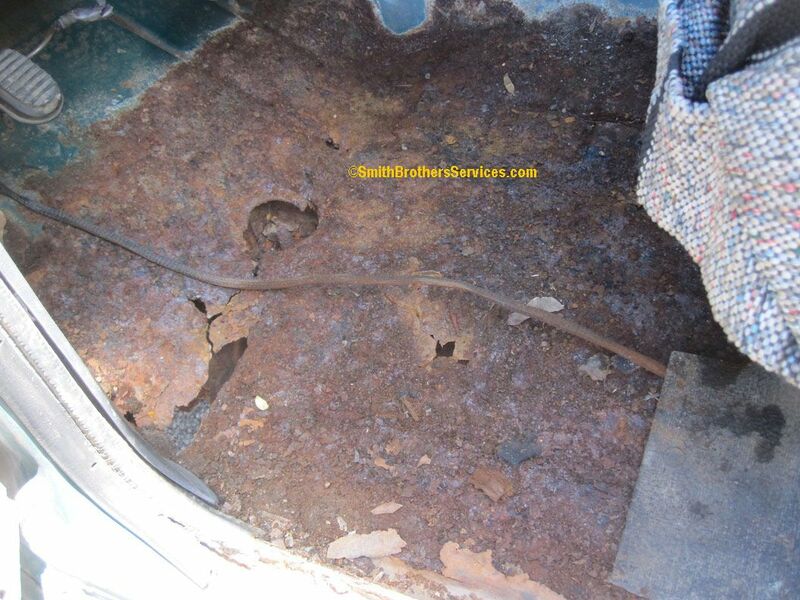 The floor rotted from the inside out. 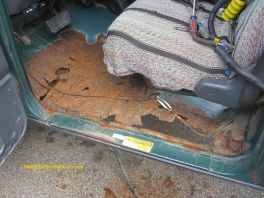 This was due to the jute padding under the floor mat holding moisture over the years. 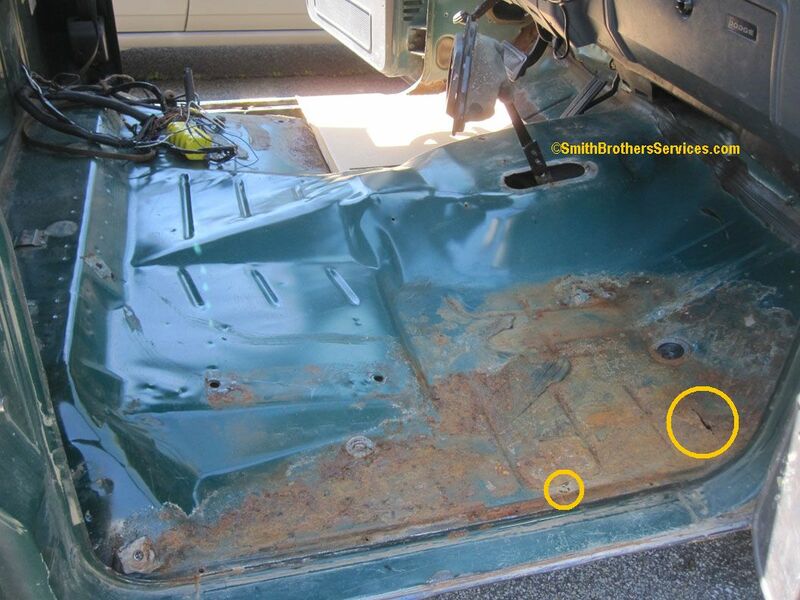 Once the pin holes started, then it began rusting from inside and outside. What added to the moisture problem was a roof light that was removed, and the hole was covered with duct tape temporarily, but it fell off, so the 3/4" hole was open for who knows how long. One of the cab roof marker lights is broke, and it too is letting water in. It was broken over the winter. I also had my suspicions about the windshield gasket leaking, or the cowl, letting water into the cab on the driver's side. So we removed the floor mat and jute padding. From the underside. You can see the wire loom covering the battery cable for the electric dump hoist. 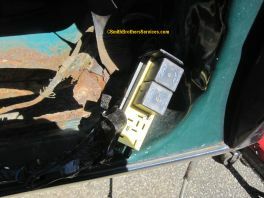 There was a main disconnect switch mounted in the cab. It had to come out to repair the floor. 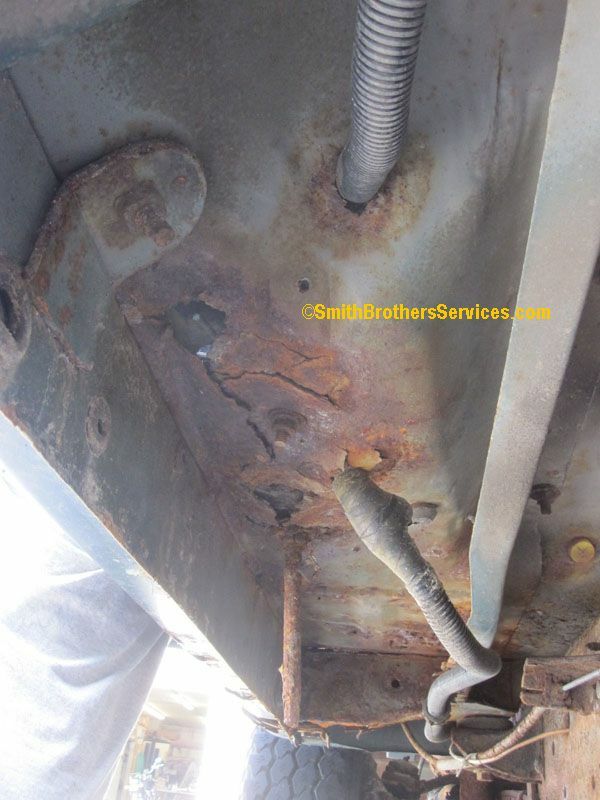 This is an ex municipal truck, so there is A LOT of extra wiring no longer needed that is coming out. You can see the HUGE wad of tape on the battery cable coming from the front feeding the dump body. There is definitely going to be a surprise in there! Another view of the underside. The cab floor support is gone too. It is not even attached to the floor anymore. After cleaning the floor up with the shop vac. 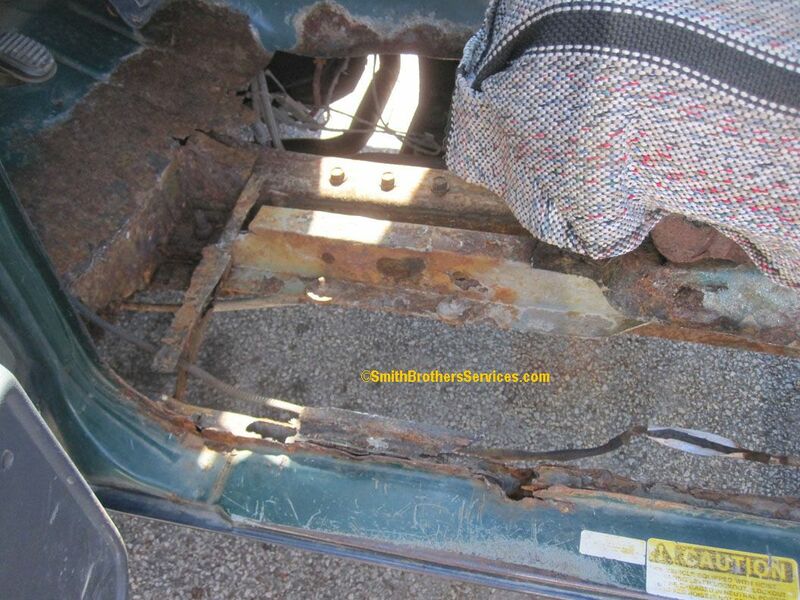 You can also see the seatbelt hanging on by a thread. That hole next to the seat is where the disconnect and dump body control was mounted. 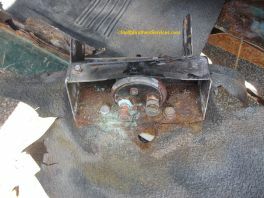 This is the underside of the dump hoist disconnect switch. I don't like it, as there is constant battery power from the battery into the cab. We will rewire it, so the hoist motor solenoid is mounted under the hood. 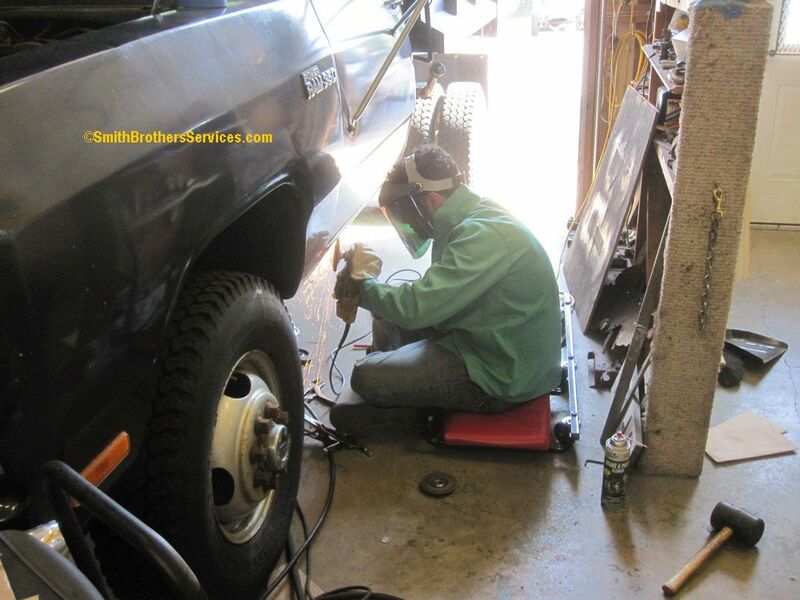 For two main reasons, one, there will only be battery power in the cable when the hoist is in operation, and two, with the dump hoist motor solenoid mounted under the hood, it is easy to service and replace if necessary. 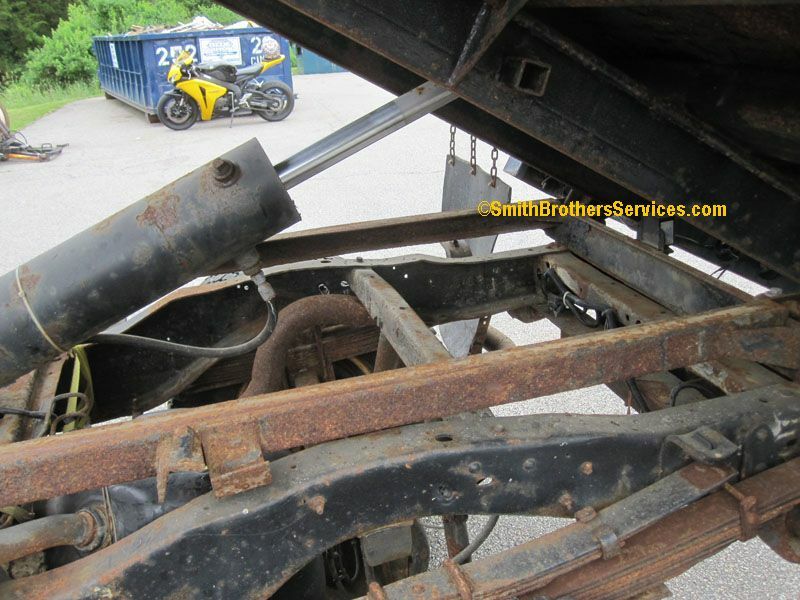 With the dump hoist motor solenoid mounted right on the dump hoist motor under the dump body, with the dump body down, the motor solenoid is inaccessible if it fails. 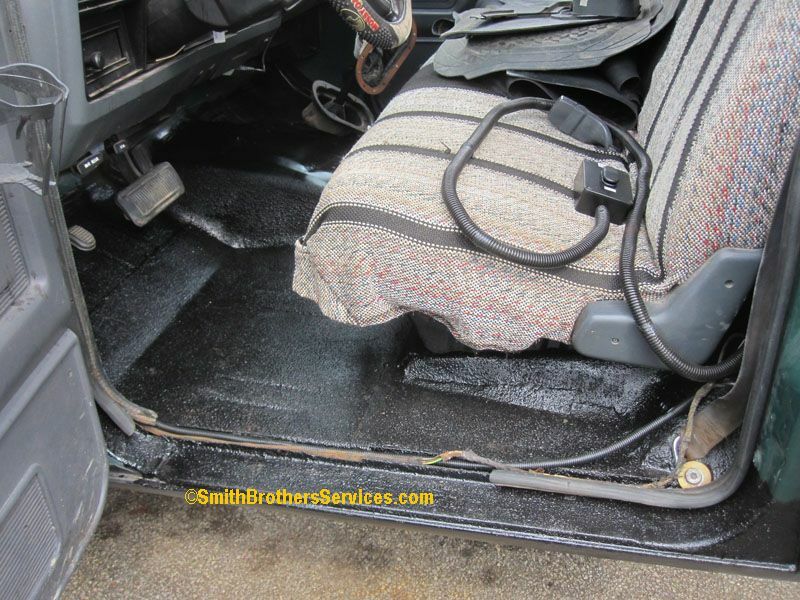 It is also in the salt spray that occurs under the dump body when driving in the winter. Under the hood (and a good coating of Fluid Film) it is more protected from the elements. 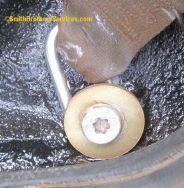 Remember I mentioned there was going to be a surprise in the battery cable coming from the battery into the dump hoist disconnect switch? Here it is. 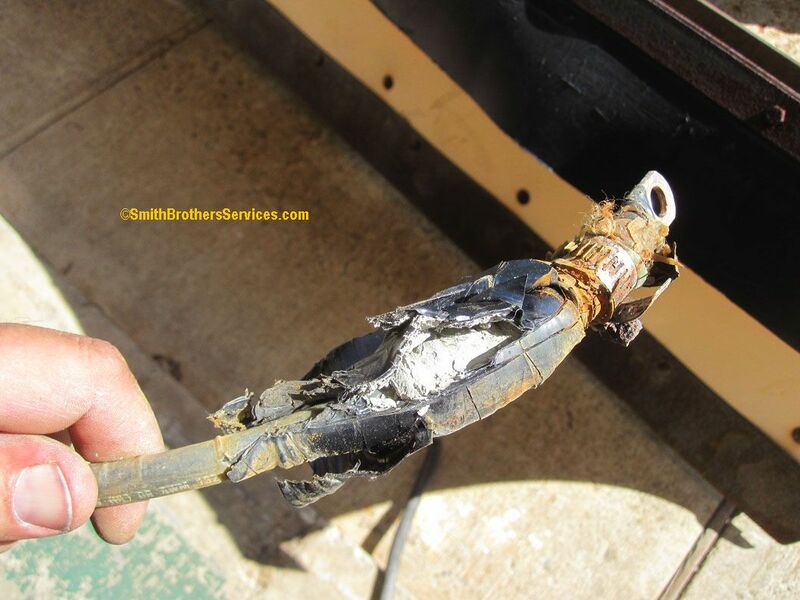 A hose clamp, over a piece of garden hose, filled in with what seems like window glazing putty, wrapped in 4 feet of stick to itself rubber electrical tape, covered in about 20 feet of electrical tape. 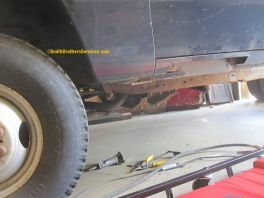 You can't see it in this pic, but there is also a ground clamp, like the one used on a ground rod for a house! Another surprise, two Ford relays wired into the dump control circuit. 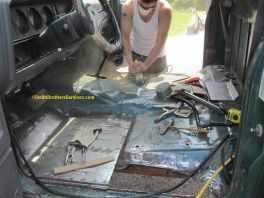 Most of the rotted floor cut out. Seat removed. Template for new floor section sitting in place. Passenger side. You can see the two small rust spots circled, which adds to my leaking cowl/windshield theory. 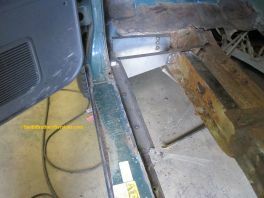 Just need to remove a section of rotted inner rocker, and a piece of the cab floor support. 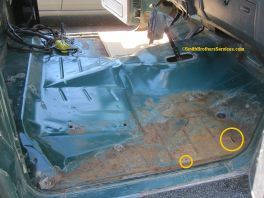 Arrow pointing to the section of inner rocker panel replaced. The original floor had a channel formed where it meets the sill plate, for the weather stripping to sit in. To make it an easier repair, I fabricated a new channel piece in two sections. Here the first section is spot welded in. 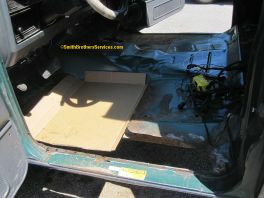 Cab floor support I fabricated in place. 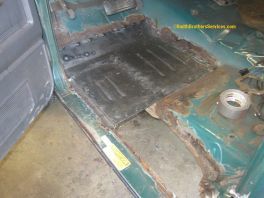 Main cab floor panel we fabricated spot welded in place. We put some beads in it with the bead roller. The whole patch will be scuffed, and coated in POR-15. Then seam sealer will be applied around all the edges. 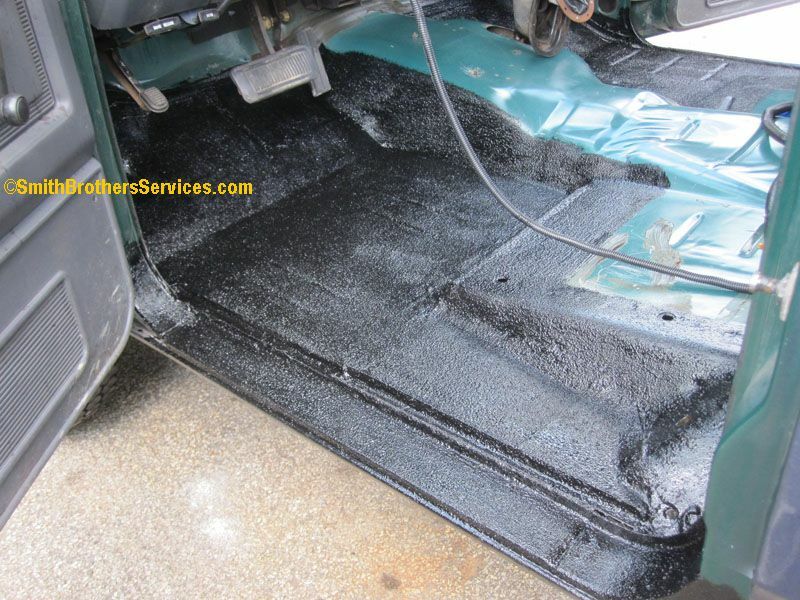 Then the POR-15 will be scuffed, and the cab floors coated in Herculiner roll on bedliner. Brian using the wire wheel to remove the loose rust on the passenger side floor. Had to get a pic of Brian moving the truck with no seat in it. Looks like a low rider! The outer rocker had a bad section I crushed with my hand, so we cut it out. I welded in a patch, and here Brian is smoothing out the welds with a flap disc. It was 93 degrees with a heat index of 105 degrees! 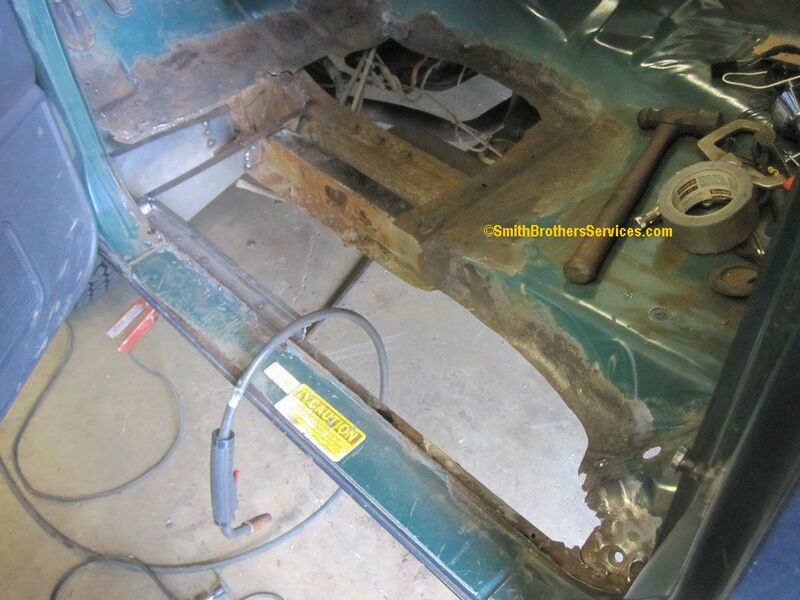 The passenger side rocker has A LOT of bondo on it, but we are not making any repairs there. We coated both rockers with 3M Paintable undercoating. 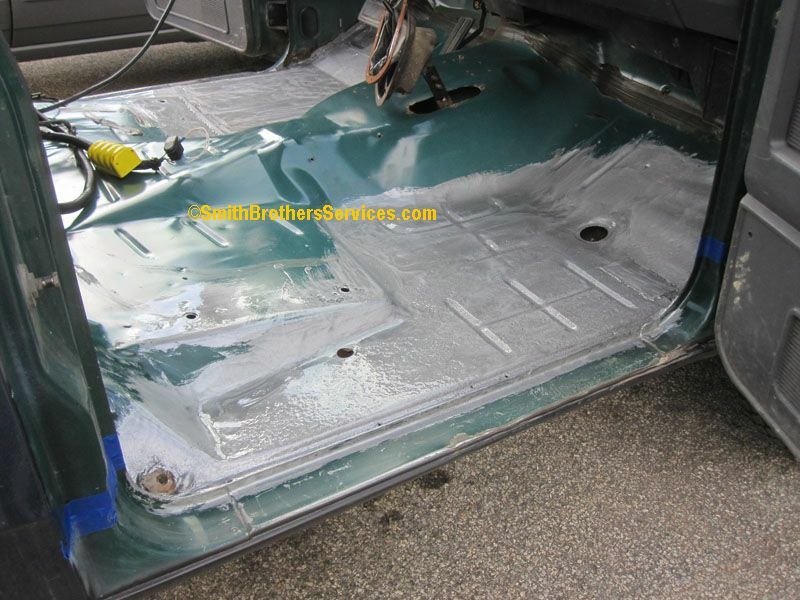 Driver's side floor with 1 coat of POR-15 Silver. The underside was done as well. Not very impressed with the product. I never used it before, but I have used a similar product from a competitor of theirs. I liked the competitors better, but it has been 20 years since I used it. 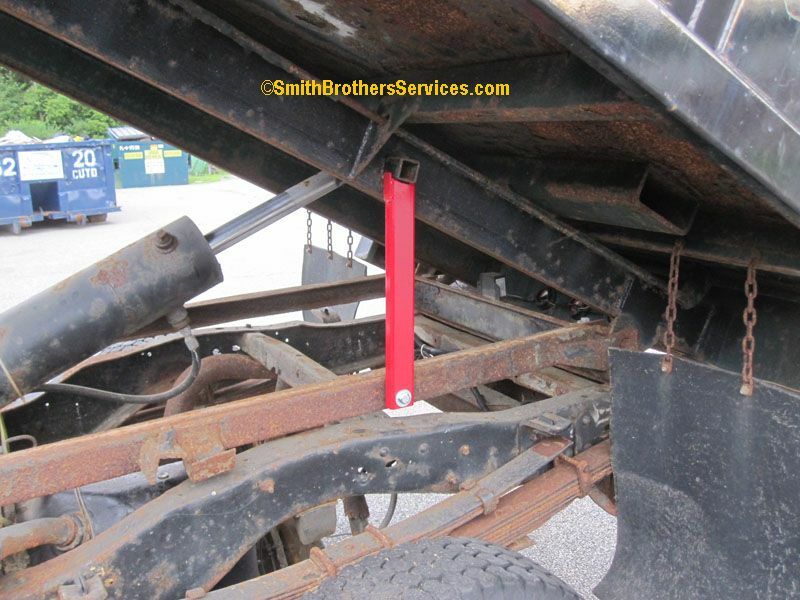 I will be using the competitors product on my 1961 Willys project, and I will revisit the issue then. 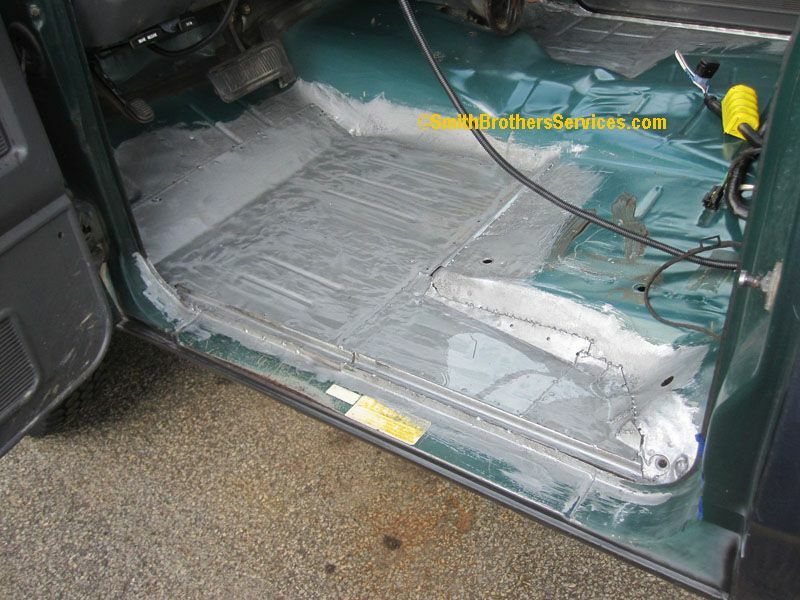 Passenger side floor with 1 coat of POR-15 Silver. We will be applying seam sealer, and then 2 coats of Herculiner Bed Liner on the floors. What I did not like about the POR-15 Silver is that it seemed very thin, more like a top coat. I know it comes in black too, and it seems it is only the pigment that is the difference. The competitors product, Mastercoat Silver, seemed more like an undercoat/primer. This POR-15 Silver dried to a glass like finish. The Mastercoat dried a little rough, like you would expect from a primer/surfacer. The Mastercoat had a more uniform pigment to it. Yes, I mixed the POR-15 with a stirrer to get all the solids off the bottom of the can. We will see soon the difference, as the Willys is getting closer to being ready for the floors to be primed. 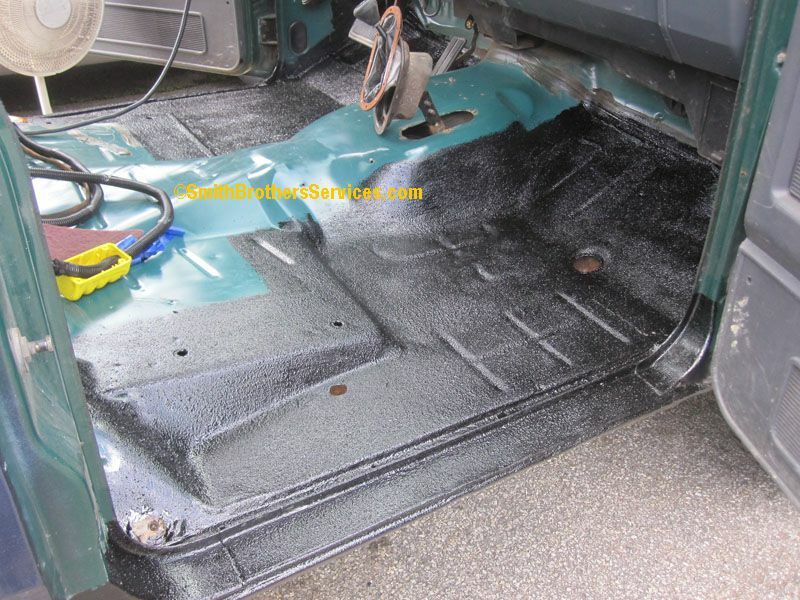 Two coats of Herculiner bed liner on floor pans. Looks good, was easy to apply, took a while to dry though. Even following the directions and applying a light first coat. 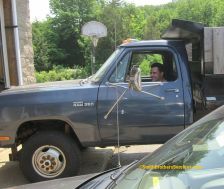 The truck was parked in the sun, it was 80 degrees, not humid, and we had a pedestal fan blowing through the cab to speed up drying. Drivers side with two coats of Herculiner. The dump body was missing a safety support leg for working safely under the body when raised. We took care of that problem. 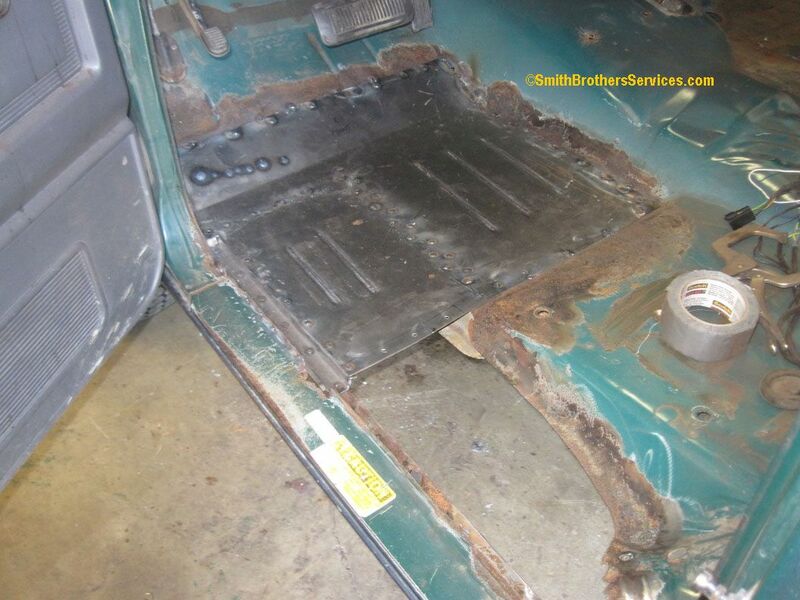 The purpose of the Herculiner was to help stop the floors from rotting out. So we only did the floor pans. 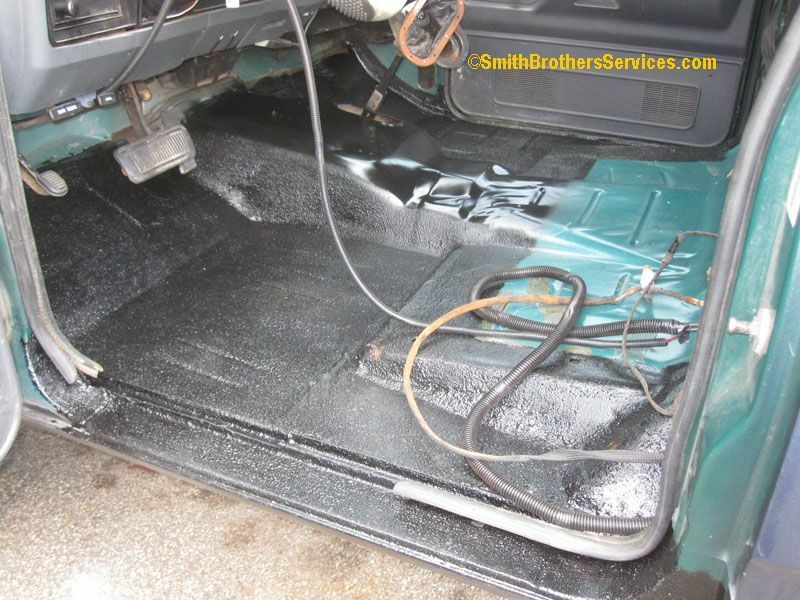 Unsure of what the future holds for the 1 piece floor mat, we decided to paint the trans tunnel gloss black. We also replaced the Square D pendant control for the dump body with the rocker switch in our own small box. Pics to follow. Another look at the end of the power cable. 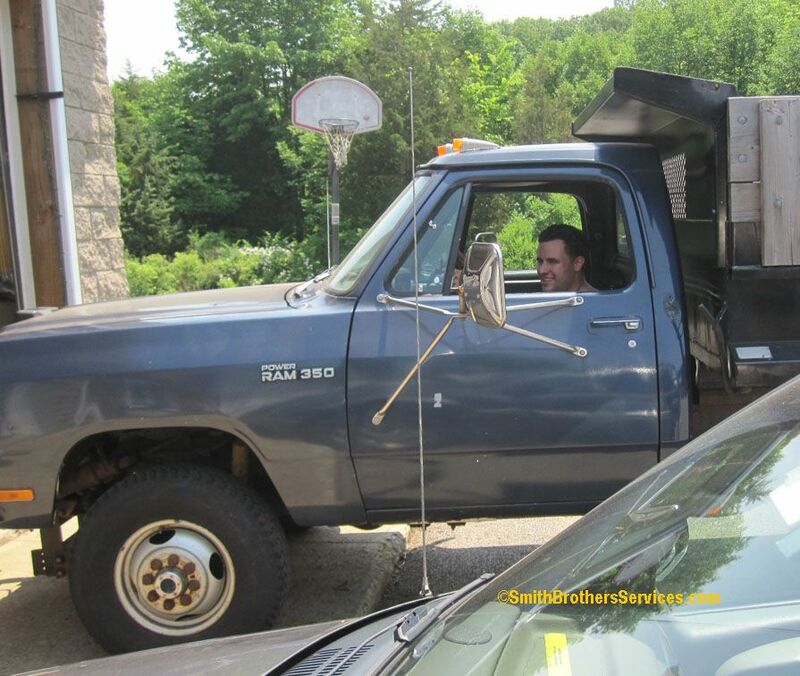 Not sure what that ground clamp is for?? 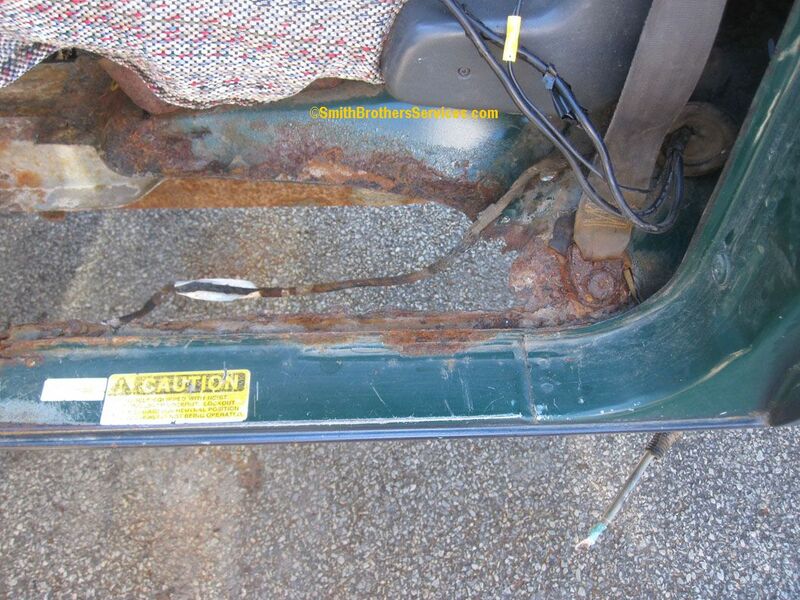 Our fix for the rotted off seat belt end. 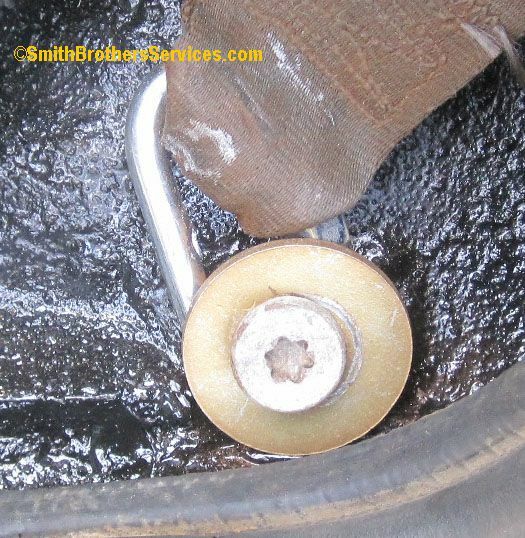 A chain repair link rated at 1540# and a hardened steel washer. Our box with rocker switch. 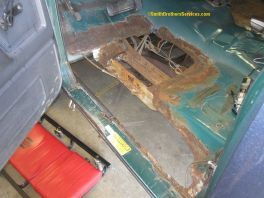 Just need to put the floor mat down, and put the trim on. We will be eliminating the relays on the dump hoist control, which also means we will be changing the dump hoist control switch itself. 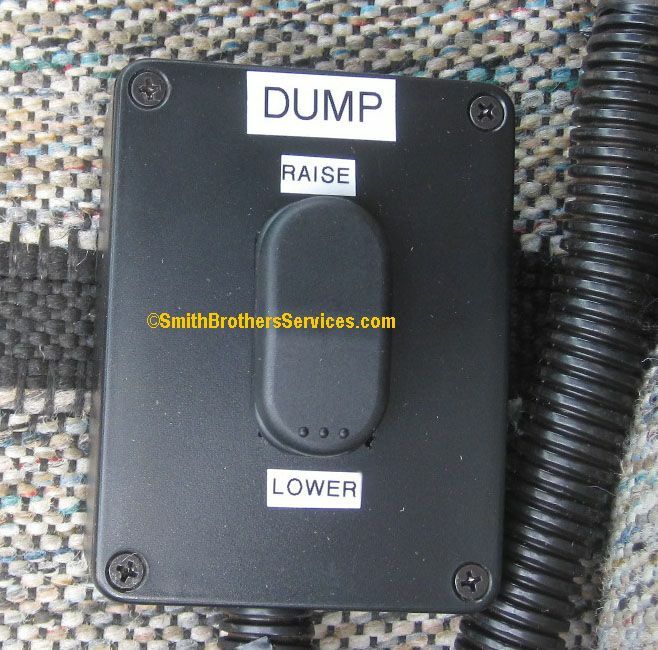 We will be replacing the dual push button switches with a single rocker switch.